with your spiritual offspring, please regard me with affection. Inspire me that my prayers come true just as I've made them. (2) May the stream of water from the mass of constructive actions, not muddied with respect to the 3 circles, born from the snow mountain of pure thoughts and actions of myself and all countless beings, flow into the ocean of a Triumphant's 4 Bodies! and may I come to enjoy the glories of an ocean of bliss and virtue! and receive the essence of his guideline instructions! may I enjoy the pure Dharma in all my lives! (5) Listening to scriptures and reasoning frees us from the obscuration of not knowing. Thinking about the quintessence teachings destroys the darkness of doubts. The light arising from meditation makes clear the abiding nature of reality, just as it is. May the illumination of my 3 wisdoms ever expand! parted from the extremes of compulsive Saṁsāra and tranquil Nirvāṇa. (7) The basis for purification is Mind-itself, a unified pair of clarity and voidness. The purifying action is the Vajra yoga of Mahāmudrā. What is purified away are the stains of fleeting, deceptive confusion. May I manifest the result of the purification, a stainless Dharmakāya! (8) Self-confidence in the view is to cut off interpolations from the basis. The essential point of meditation is to safeguard against wavering from that. The supreme behaviour is to cultivate meditation's (essential) point displaying as everything. May I gain self-confidence in the view, meditation and behaviour! (9) All phenomena are miraculous emanations of the mind. Mind is no mind: it is devoid of an essential nature as mind. Void and so, without obstruction, it makes anything appear. Understanding this well, may I cut out the root from the basis! are deceptively confused into objects. is deceptively confused into a self. we roam throughout the expanse of compulsive existence. May I once and for all cut the root of deceptive confusion, my unawareness! (11) Not existent: not even the Triumphant have seen it. Not non-existent: the foundation of everything of Saṁsāra and beyond. Not a dichotomy nor juxtaposition, but a unified pair: the Madhyamaka middle way. May I realize the actual nature of the mind, free from extremes! (12) Not characterized as anything, saying it is "this." Not refuted as anything, saying it is "not this." The actual nature, beyond intellect, is an unaffected phenomenon. May I gain certainty about the utmost point that is totally perfect! (13) Not realizing the actual nature, we circle in the ocean of Saṁsāra. Realizing the actual nature, Buddha is not something other. Everything that is this and not this, nothing excluded. May I become aware of the faults regarding the actual nature, the ālaya foundation of all! (14) Whether appearance, it's the mind; whether voidness, it's the mind. Whether realization, it's the mind; whether confusion, it's my own mind. Whether an arising, it's the mind; whether a ceasing, it's the mind. May I cut off all interpolations on the mind! may I become skilled and cultivate the practice of mind's deepest point! (16) The waves of subtle and coarse conceptual thought still in their place. Without movement, the undercurrents of the mind naturally settle. The pollution of the silt of dullness and bewilderment separate out. May I stabilize a stilled and settled, unmoving ocean of Śamatha! in a state cut off from wavering whether the deepest point is "this" and "not that,"
may (my mind) reflexively know its own face, without confusion! (18) Having looked at objects, there are no objects – one sees them as mind. Having looked at the mind, there is no mind; it is void by essential nature. Having looked at the 2, dualistic grasping releases itself into its own place. May I realize the abiding nature of the mind as clear light! (19) It is the state parted from taking to mind according to the great seal, Mahāmudrā. According to Madhyamaka, the Middle Way, it is the state parted from extremes. 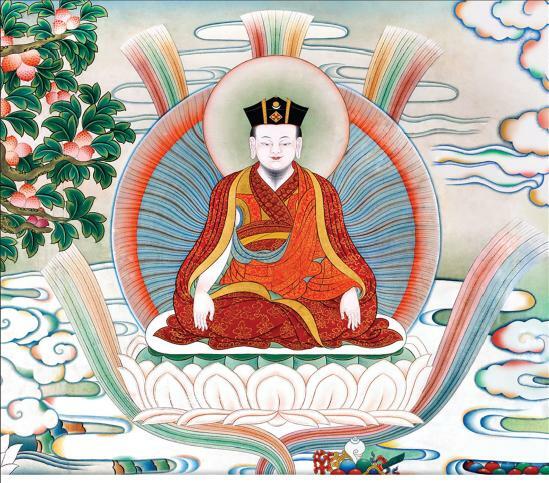 Dzogchen, the Great Completeness, calls it also the state incorporating everything. May I gain the self-confidence that knowing one is the realization of the point of all! (20) Great bliss, without clinging, has unbroken continuity. is parted from the veils of obscuration. Non-conceptuality, beyond all intellect, spontaneously accomplishes. May my experiencing the boon experiences, without striving, have unbroken continuity! (21) Grasping at the boon experiences, clung to as good, releases itself into its own place. Deceptive confusion, conceived of as bad, in its self-nature, is pure in the sphere (of voidness). Normal awareness is without ridding or adopting, parting or attaining. May I gain stable realization of the (deepest) truth, the actual nature, parted from mental fabrication! (22) The self-nature of wandering beings is always that of a Buddha. Yet, by the power of not realizing this, they endlessly roam in Saṁsāra. for limited beings with boundless suffering! (23) While showing affection with a display of unbearable compassion not at all impeded, the essential nature – the (deepest) meaning of voidness – nakedly dawns. parted from points of deviation! May I reach the endpoint of fulfilling, ripening and cleansing, and become a Buddha. may the pure aspiration prayers of myself and all limited beings come true in this way, just as we've made them.